A year of roadworks on the Chaussée d'Ixelles has been completed - with a new "semi-pedestrian" zone inaugurated at the weekend. From 7.00 to 19.00, the street between Porte de Namur and Place Fernand Cocq is now reserved for pedestrians, cyclists and buses - which are limited to 20kph. 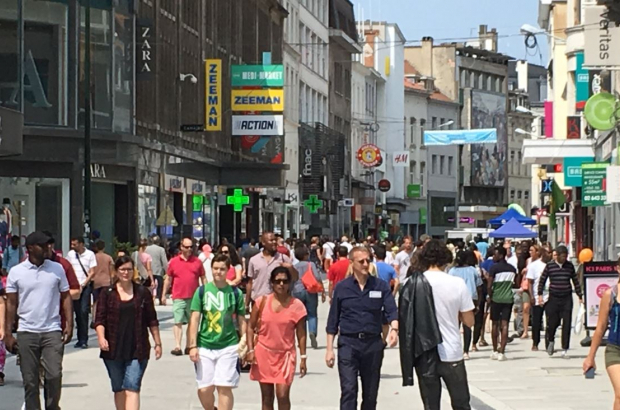 Chaussée d'Ixelles is Brussels' second-busiest shopping street after Rue Neuve, with more than 200 stores. Regional mobility minister Pascal Smet said the works were completed on time - although some trees still need to be planted and street furniture put in place. Roadworks will begin on Place Fernand Cocq in the autumn and are due to be finished next April. Will be interesting to see if businesses now located in this working hours pedestrian zone go boom or bust. Why would they go bust?